The botanical garden is located at 4101 Sherbrooke Street East, at the corner of Pie-IX and Sherbrooke Streets, in Maisonneuve Park, facing Montreal's Olympic Stadium. It contains a greenhouse complex full of plants from around the world, and a number of large outdoor gardens, each with a specific theme. The outdoor gardens are bare and covered with snow from about November until about April, but the greenhouses are open to visitors year round, hosting the annual Butterflies Go Free exhibit from February to April. The garden was founded in 1931, in the height of the Great Depression, by mayor Camillien Houde, after years of campaigning by Brother Marie-Victorin; the grounds were designed by Henry Teuscher. It serves to educate the public in general and students of horticulture in particular, as well as to conserve endangered plant species. The grounds are also home to a botanical research institution, and to the Montreal Insectarium; offsite, the Garden staff also administer the Ferme Angrignon educational farm and petting zoo. While it charges admission, city residents can obtain a pass granting free admission to the outdoor gardens, so many people visit regularly, even if only to sit under the trees. The outdoor areas are also free to everyone between 6 p.m. and nightfall during the summer season (May to September). Many weddings are performed in the gardens every year. The nearest metro station is Pie-IX, which is located on the corner of the Olympic Stadium. The Chinese Garden is constructed along the traditional lines for a Chinese garden. It has many winding paths, an artificial mountain, and a building in the Chinese style housing a collection of bonsai and penjing that have been donated. The garden is populated with Chinese plants. 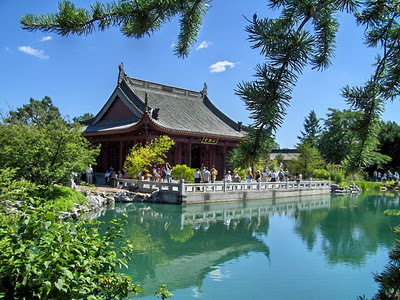 It is the largest Chinese garden in the world outside China. The Japanese Garden is populated with Japanese plants, and it contains a building in the Japanese style containing an exhibit on tea. The Japanese tea ceremony is performed there during the summer, and anyone can take classes to learn more about it. Other traditional Japanese arts, such as Iaido and Ikebana are occasionally demonstrated there as well. It also includes a large koi pond; visitors often feed the koi. The garden hosts an annual Hiroshima memorial ceremony on August 6, with the hourly ringing of a Japanese Peace Bell made in Hiroshima. The First Nations Garden is populated with Canadian plants; the maple, birch, and pine trees shade its paths. It has several totem poles and exhibits demonstrating traditional Native American artwork and construction methods. The Alpine Garden has several paths winding over a rocky outcrop which is covered with tiny, delicate alpine plants. Other gardens include the poisonous plants garden (which has samples of various poisonous plants along with information on the effects of various doses), the economic plants exhibit, the flowery brook, and an arboretum. The botanical gardens are also the home to some wildlife; primarily squirrels and ducks, other slightly less common animals such as turtles and herons also live there.